Conventional milk makes me gag. This stuff tastes like cookies. Nom. To the horror of the CDC and my mother, I drink unhomogenized, unpasteurized, raw milk. And I freaking love it. The disgust and even vehemence I am met with when I mention the word “raw” alongside milk is amazing. If you were to see the face of the person watching me drink the stuff, you would guess that they were witnessing the murder of kittens. But I don’t drink it for the reaction I get. I drink it because the taste is overwhelmingly better. I know, I know… there is a lot of “woo woo” out there about the magical properties and nutrients in raw milk and I don’t exactly buy into that. However, I do believe in the difference in quality between conventionally raised cows, caged and stuffed and grain fed VS. the grass fed, pasture roaming cows that I get my milk and meat from. Specifically, the omega 3 to omega 6 ratio in the fat present in grass fed milk and beef is superior to that of conventional grade stuff. I’m sold right there, and I haven’t even started on conjugated linoleic acid (also known as CLA). I’ll save that for another time. I do pay a pretty price; about 2.5 times more than conventional store bought milk. But to me it is absolutely worth it. I know the source and I believe in the quality. My mother recently got wind of the amount of raw milk I drink, which is upwards of 4 glasses a day. 600 fantastic calories. To save me from my ignorance, my mom stressed to me the dangers of raw milk through multiple links to CDC and FDA websites. 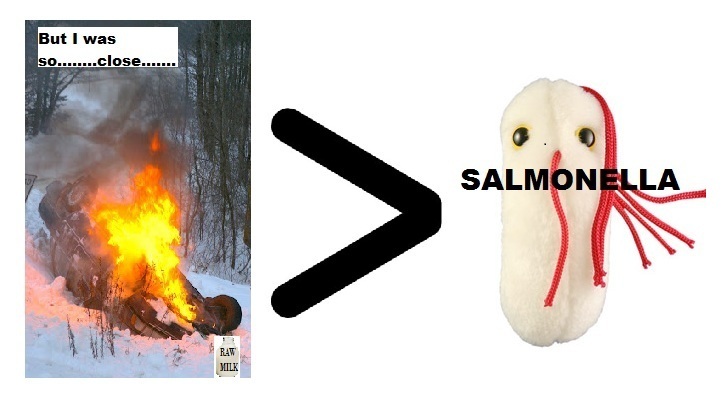 To summarize those links, “YOU WILL GET SALMONELLA AND YOU WILL DIE”. But wait just a minute. Using the data, straight from the CDC’s loins, I am roughly 35,000 times more likely to contract food borne illness from other food sources than I am from raw milk. 35,000 times. I’m more likely to burn up in a car accident on my way to buy the raw milk. I kid you not, that is a stuff animal version of Salmonella. It’s real. You can buy it. But I digress. I guess my point is, I know my source. Redmond Farms tests their milk constantly and their handling practices are of the highest standard. The scare tactics and statistics from the CDC and FDA include ALL sources of raw milk: the backdoor, illegal operations alongside the reputable ones. To put that in perspective, it’s like lumping Rolex sales made from the briefcase carrying men on the beaches of Mexico in with sales from the legit Rolex store… and then warning everybody about the dangers of buying a Rolex watch from ANY source. You wouldn’t do that. So don’t give me that look as I drink my milk. This entry was posted in Food and tagged CLA, grass fed, raw milk, salmonella. Bookmark the permalink. The label is without the organic stamp. However, they are a local company here in Utah and a quick read of their website shows that they go above and beyond the requirements. Why organic is not on the label I am unsure. It might have something to do with the fact that selling raw milk has a whole set of its own requirements. But you’ve sparked my interest enough to give them a call this morning… stay tuned. i bet you are right. i’m sure the USDA or any organic certifier has a lot to risk if they stamp raw milk. is the main reason it’s so controversial because of the possible threat of bacteria?! glad you found a source you trust and love so much! yay supporting your community! Hi, I say drink whatever you want as long as you’re happy! Raw milk is very good and creates an ancient form of eating, as that’s what they drank for the longest time! Try flying without dreams and hope, and you’ll miss out on the clouds! Thank you for the follow! Let the pen burn the page black! I admire your writing and eagerly await your book. Thanks for commenting! Hi, thank you for taking an interest in my writing! Thank you for the great compliment as well! Urine doesn’t suit my tastebuds, but goatkind has been known to sip! Have a nice evening! When inspiration finds your fingertips write a lightning strike and smile! Nice writing. Didn’t think I would have kept reading when I saw milk but you grabbed me! I’m curious. How does the taste differ from the mainstream milk? Don’t blame you, I’ve never liked milk much either so I understand your sentiments. Glad you enjoyed the post. As for the taste, I’d say it is a lot creamier and a little sweeter. ohmigods. i want! you can’t get that here in Colorado, unless you buy it directly from the farm. But I’ve had raw cheese. Never going back to pasteurized! I’ve seen people fill an entire grocery cart full of the stuff. They’re either smuggling baby cows or freezing it… Okay fine they’re freezing it. I don’t drive, am sharing a small freezer with 4 other people…maybe there is an affordable raw milk delivery service roundabouts the greater denver area…I’ll have to look into that.